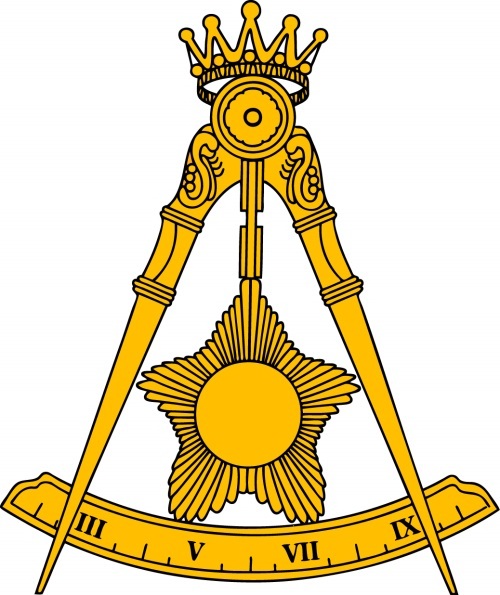 Duty, reflection and study are the gateway to opportunity; as such one honors those relationships to God, family, country and Masonry. The apron of the 4th degree is white and black, with a letter "Z" and all-seeing eye. The jewel of this degree is an ivory key with the letter "Z" on the wards. The teachings: secrecy, obedience and fidelity. This degree teaches us to be tolerant and respect the opinions of others. All should share freedoms of political and spiritual ideologies. The apron of the 10th degree is white, with a black flap, and with three arch-shaped gates - over each a head on a spike. The jewel of this degree is a dagger as in the 9th degree. Liberty ; in our mind and our hearts, motivated by duty and honor are the lessons of this degree. The apron worn is purple, bordered with white, and with the "Enochian delta" (hexagram with inscribed Tetragrammaton) in the center. The jewel comprises a circular medal of gold. This degree teaches us to reflect and scrutinize ones self. We should strive to be true to our God and ourselves. The apron being of white silk, bordered in gold, with the Ineffable Delta in the Center is truly emblematical of the degree. The jewel of the 14th Degree is split; one being a quadrant (compass open to ninety degrees) topped by a crown and with a nine-pointed star on the obverse, the other being a five-pointed blazing star (with the Tetragrammaton) on the reverse. The compass is opened on a segment of a circle, inscribed with the numbers 3, 5, 7, 9.